Paying homage to an Elizabethan Era, ALEXANDER McQUEEN fall 2014 got our attention once again. The hair complemented the usual over the top aesthetic of the collection, combining futuristic elements with the influence of the period. 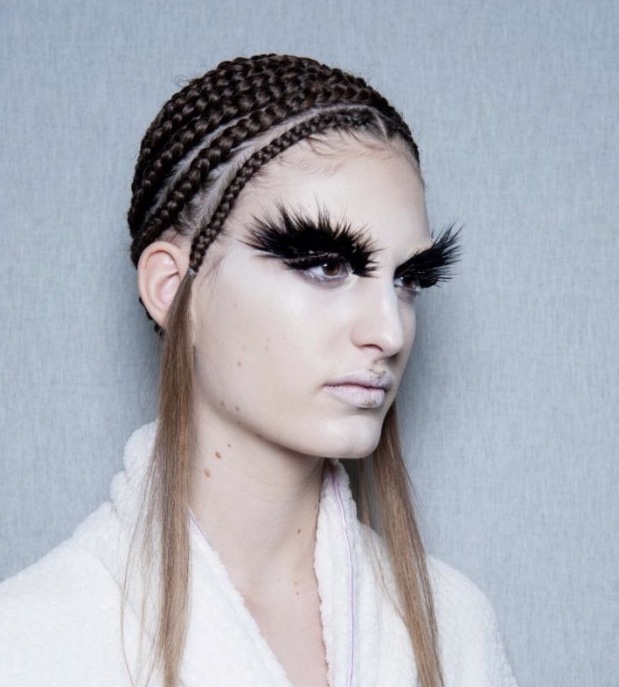 Braids, hair extensions, and lash extensions were all part of the beauty backstage, here’s a little peek..
“The hairstyle for McQueen is interesting in that you aren’t quite sure if the hair is paying homage to the past or a window into the future. There are certainly historical references at play, namely from the Elizabethan era; however, the long extensions on each temple offsetting the spiraled braids makes one unsure of where to place this style on a timeline. It’s romantic and innocent, yet dark and punk in a way. It’s anything but simple easy hair, both to create and to digest, which is what makes the McQueen show so noteworthy.” -Guido, Redken Creative Consultant. ALEXANDER McQUEEN fall 2014 backstage beauty + runway commentary by Brigitte Segura. More fdmLOVES ALEXANDER McQUEEN fall 2014 runway, backstage beauty + details on tumblr.